The Polare bookstore in Maastricht came under threat when Polare declared bankruptcy in February. It is converted from a 13th Century Dominican church in 2006 by architects Merkx+Girod (now Merk X), Polare is a temple of books that raises reading to a religious experience. At this Argentinian icon, visitors can go from stage to page. It was first built as the Teatro Grand Splendid in 1919, before becoming a cinema in 1929. With frescoed ceilings, ornate carvings and plush red stage curtains, it has retained its original splendour: customers can sit in the theatre boxes to browse in comfort. China’s most beautiful bookshop–Nanjing’s Librairie Avant-Garde was built inside a former government car park which has also been a bomb shelter. To go into the 4,000 square meters underground space beneath Wutishan Stadium, visitors need to follow a yellow-striped road. Hidden behind an unassuming facade, Corso Como was founded in 1991 by Carla Sozzani, the former editor-in-chief of Italian Vogue. She brought her stylish panache to the complex that consists of book and design stores with a cafe, hotel and roof garden. The bookstore is a mix of art, architecture and fashion titles. This bookshop lies on a town which is a book lover’s dream. Nearly everywhere you turn every narrow, ancient cobblestone street, nook and cranny, is a used bookstore. The former fire stations, the old cinema — even the castle! Honesty bookshop is one of them. I must say that The Honesty Bookshop is a truly lovely place. You would never use a door so old to gain access to any book-selling establishment, nor would you find one so free of staff AND formalities! I think that this place has to be right up there in the top ten lists of eccentric book stores. Livraria Lello & Irmão, also known as Livraria Chardron or simply Livraria Lello (Lello Bookstore) is a bookstore located in central Porto, Portugal.Along with Bertrand in Lisbon, it is one of the oldest bookstores in Portugal. In 2011, the travel publishing company Lonely Planet classified Livraria Lello as the third best bookstore in the world. This is a unique place in Mexico City; a sort of cross between a bar, cafe and bookshop, and the art and culture vultures turn out here in force. It has a small venue where you can appreciate live music. This bookshop is a pleasant place to come and have a slice of cake and a cup of cappucino, while music plays in the background. Indeed this bookshop does look amazing! And plus, it contains publications in the English language – mostly on art but no wonder since it is an integral part of one of Rome’s leading exhibition centers. 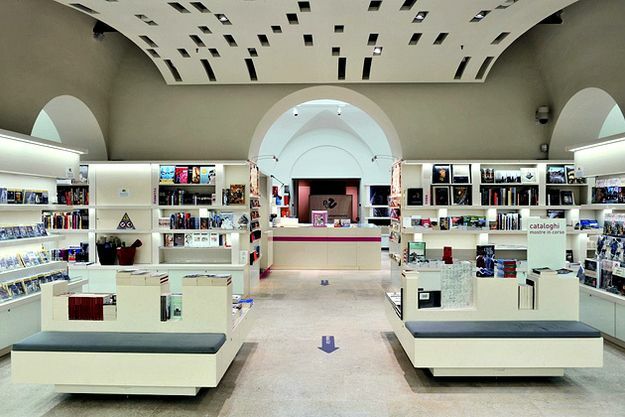 The Bookàbar Bookshop is located in the Palazzo delle Esposizioni, the largest inter-disciplinary exhibition area in central Rome. The large Bookàbar bookshop, designed by architect Firouz Galdo, occupies an area of about 450 square meters and consists of three large rooms: two devoted to books, catalogues, music CDs and DVDs – national and international mainly about art but also architecture and design, and particularly rich in subject matter connected with the Palazzo exhibitions; the third, connected to the other rooms, sells dedicated merchandising, closely following current trends. The bookshop has an independent entrance from Via Milano, at the corner of Via Nazionale, making it independent from the exhibition area.